While the S&P (but not the Dow Industrial Average) enjoyed solid gains on heavy volume accumulation it was left to Tech Indices to steal the headlines. The Nasdaq closed the week on new closing highs as volume surged. 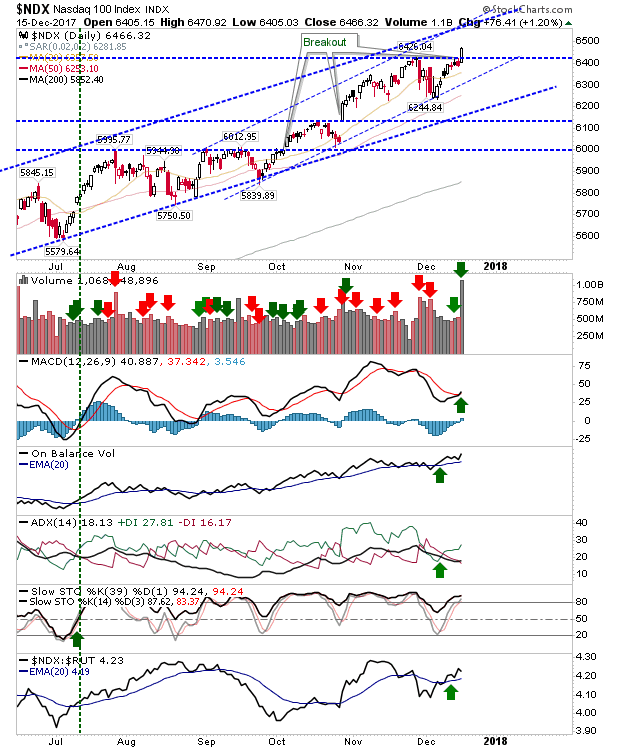 The gains were enough to see a new 'buy' trigger in the MACD which keeps the index net bullish. The Dow Jones Index didn't enjoy the same level of gains as the S&P, Nasdaq or Nasdaq 100 as it clung on to channel resistance. 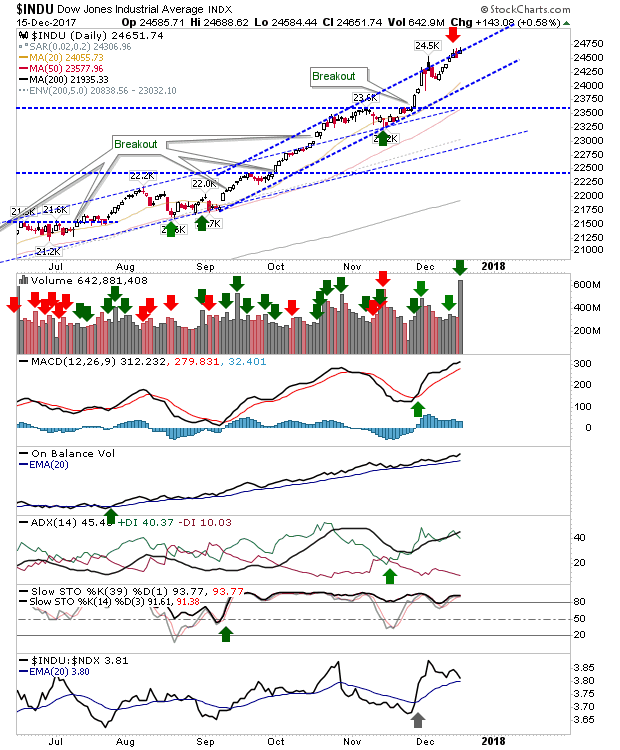 Given the presence of resistance, it does offer a shorting opportunity for those willing to keep stops relatively tight as S&P and Tech indices are in a good position to make further gains. The Russell 2000 looks to be digging in at 1,520 support and now challenging the 'bull trap'. Technicals haven't fully recovered but another day like Friday's would probably be enough to see new 'buy' triggers in the MACD and ADX. 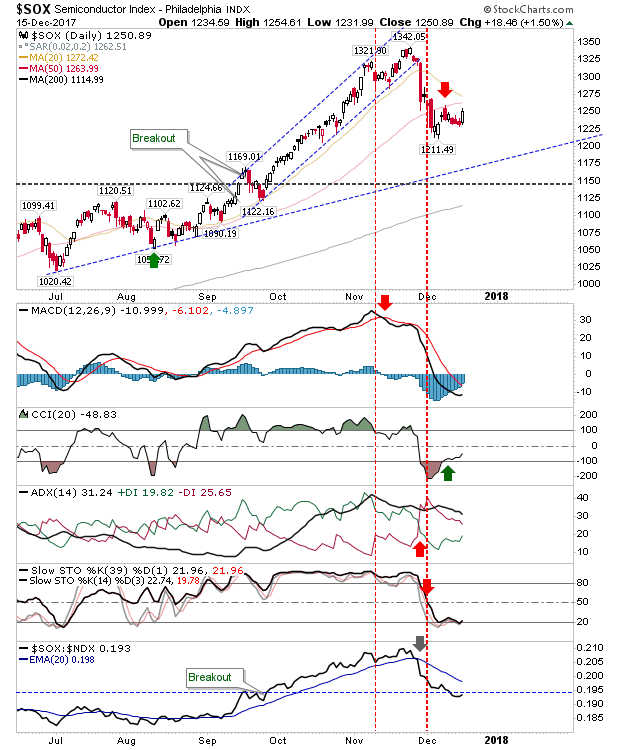 Buyers of the Semiconductor Index took advantage of the slowdown in the reversal from the 50-day MA, forcing shorts into a spate of cover buying. Even if this buying was to continue Monday it wouldn't be enough to reverse current 'sell' triggers in supporting technicals leaving the short play as the preferred position until negated; a solid move above the 50-day MA would probably be enough to kill the short trade. 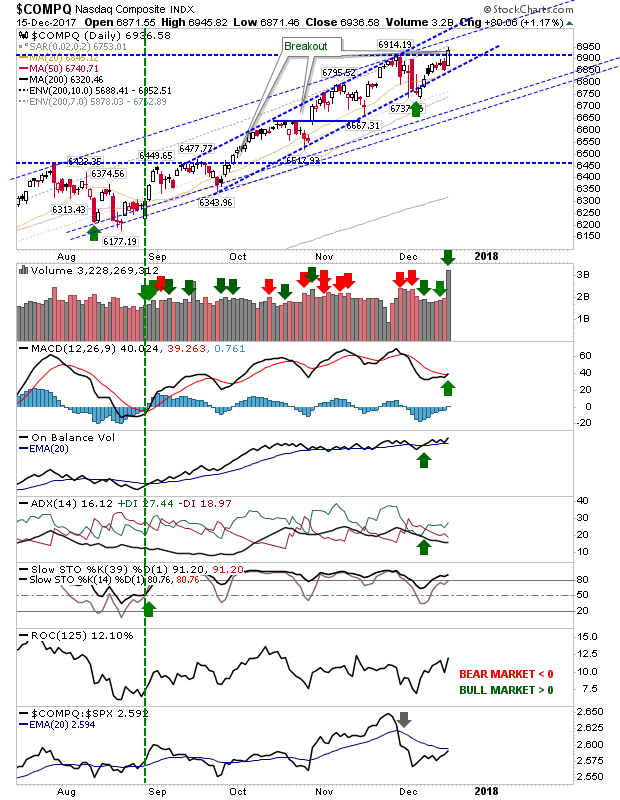 The Nasdaq 100 offered the cleanest breakout as it brought with it a fresh MACD trigger 'buy' to run alongside the bullish trend. 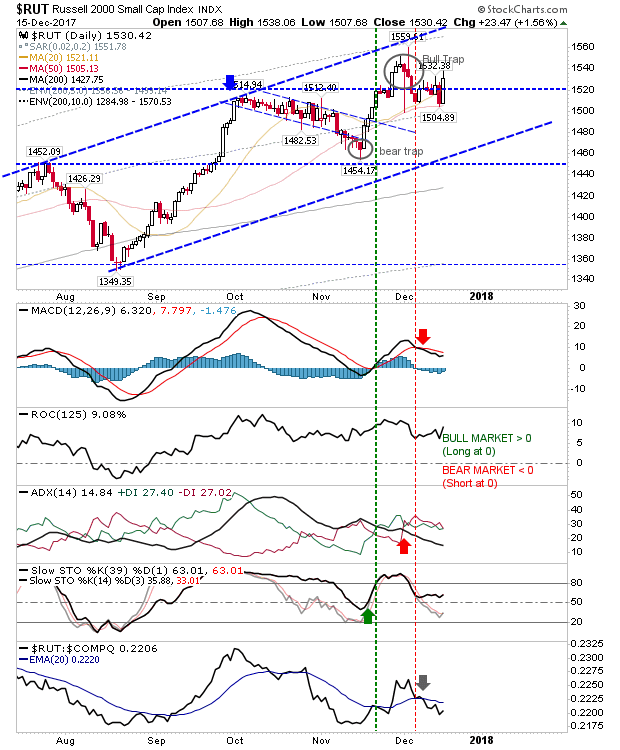 The Index is outperforming the Russell 2000 which should keep money flowing into the index. As a final point, the S&P continues to make its way to channel resistance. Heavy volume buying was backed up by strong relative outperformance; buyers of the November 'bear trap' will be pleased. 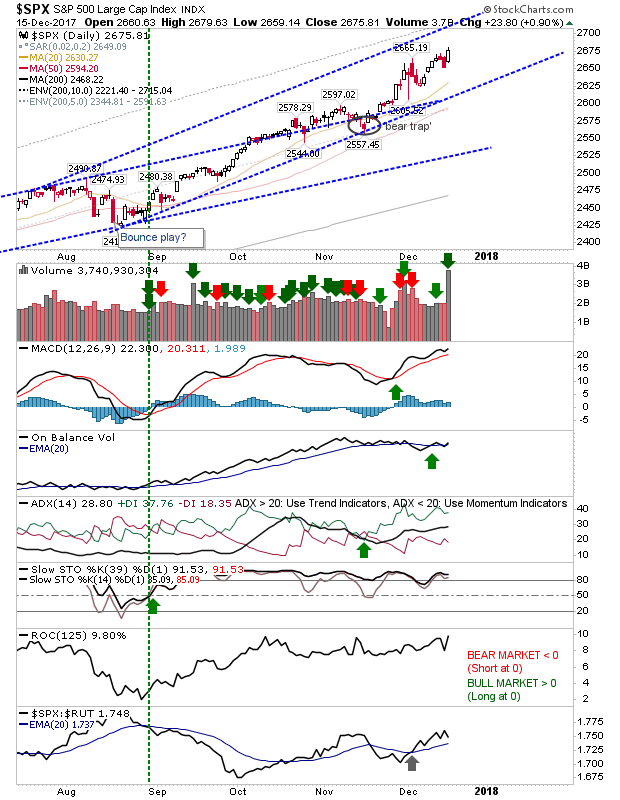 Monday will be about holding the gains and where possible set up for some follow through upside as indices look to make new all-time highs into end-of-year. Action is likely to quieten as the week progresses, so if nothing happens into Wednesday then don't expect much else to change until 2018 rolls in.